Delicate wires spiral downward carrying reflective green glass beads on our splendid Asian inspired bell chime. 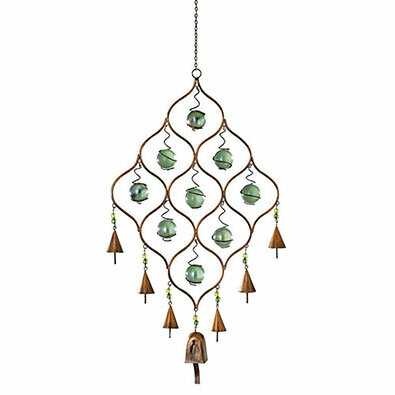 Hear the music of the bells with the breeze when you hang this lovely accent piece in your garden, arbor or patio area. Made of copper-toned metal and glass. Chime measures 56cm tall and hangs on a 23cm chain with hook.